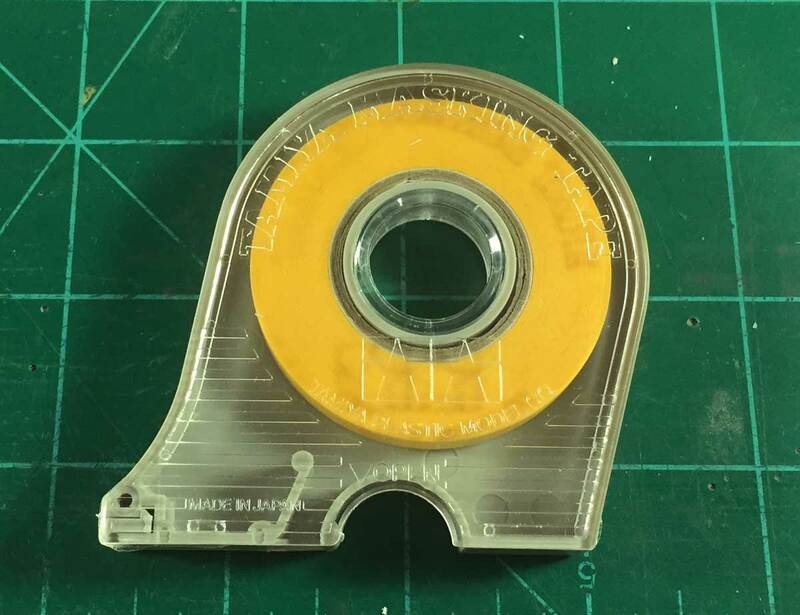 Tamiya 6mm masking tape is very popular among military modelers as they work to finish their models. As many military modelers seem to be way ahead of the curve on lots of techniques, I felt there was nothing to lose but a few dollars in trying the Tamiya tape. On previous models, I had used rubber cement to cover some of the lettering to reflect a fresh patch of paint and new lettering after a model was weathered. Three of the latest models are USRA single sheathed box cars built in 1919 and assigned to various railroads at that time. The prototype data included with the Westerfield directions for their USRA sheathed box car kits indicate many railroads quickly painted out portions of the car lettering after the USRA control ended. I wanted my models to reflect a hasty paint out and the Tamiya tape was put to the test. The above image is a portion of a larger view that was shared by Claus Schlund, another Pre-Depression Era modeler. 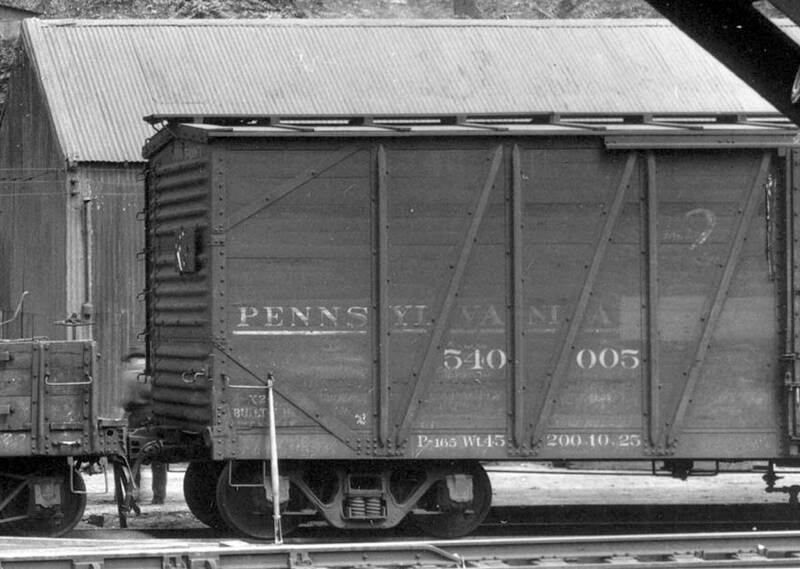 While this box car is lettered for the Pennsylvania, it was originally lettered for Pennsylvania Lines. The corporate structure of both companies was reorganized in 1924 and shop forces were tasked with painting out the Lines portion on many freight cars. A lighter shade of paint can be seen in the image to the right of the Pennsylvanis lettering. I wanted to mimic this look on my model so I cut the tape to cover an area where the lettering would have been. Here’s a look at the model with the tape applied. I wanted two boards on the door to look like they had been replaced, so they were covered with a thin strip of tape. Of course, some paint may have failed in the seven years since the car was built. Prismacolor pencils were used to alter the look of some of the wood sheathing. The lighter color is a 30% warm grey while the darker color is a 70% warm grey. A smudge stick (also known as blending sticks, tortillions, or stumps) was used to blend these into the model surface and dull the initial application. Weathering washes and PanPastels came next. Here’s what the model looks like after the weathering washes and PanPastel application. The tape was removed to reveal the original shade of paint. Tape was also used to cover the reweigh data along the sill where the lettering is a bolder white. While the car was built in 1919, it needed to be reweighed periodically for the railroads to properly charge for shipments. A goal is to use reweigh dates in the two years previous to my November 1926 modeling date on all of my freight car fleet. On this model, it looks like new paint was applied to cover old data, then the new data was stenciled onto this patch. The prototype image inspired similar techniques used on this Western Maryland box car. In this example, the tape covers a long area where the road name was original lettered as well as smaller areas where the C.T. (Columbia Trust) initials were applied when the cars were assigned by the USRA. The car was also over sprayed with a very light coat of the original car color. This was done to fade the lettering. Prismacolor pencils would be used next to alter the shade of different boards before more weathering layers are applied. After the washes and PanPastels, a light cool grey pencil was used to highlight hardware and edges. Chalk marks were added with the same pencil before the masking tape was removed. The newer lettering received a light dab of PanPastel raw umber to cut the brightness of lettering applied a year previous to my modeling era. On this final example, more tape was used to cover repainted areas and to make the area around the reporting marks and car number look newer. After reviewing many images of B&O freight cars taken in the early 1920s, it seems the company began following newer lettering guidelines in applying the B&O and car number with the lines above and below. I used the tape to cover the decal work so this portion of the car side would look recently painted. After a dance through the weathering factory, the model is ready for service with fresher looking reporting marks and painted out areas where the original B&O and car number were applied. 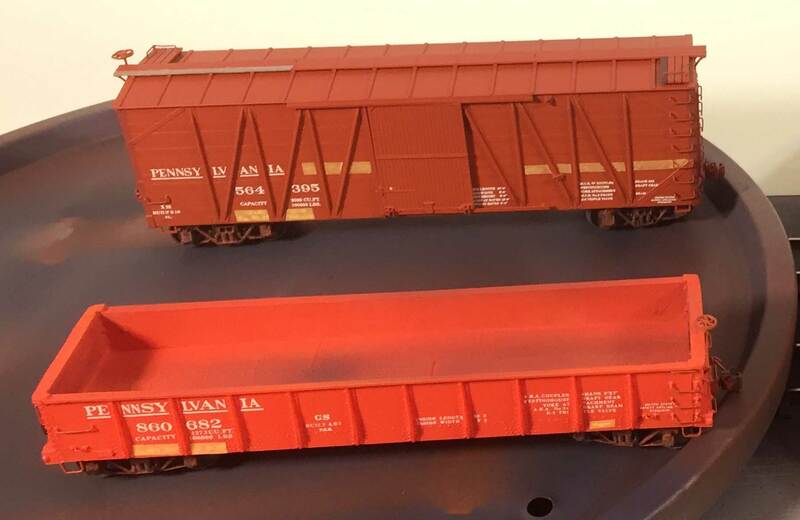 FYI, all three of these box cars are Tichy Train Group HO scale USRA single sheathed box car kits with Westerfield decal sets applied. I’m pretty satisfied with how the Tamiya tape has worked on this work. Each of these models had two weathering washes applied and none of the liquid crept under the tape. I did burnish the tape into place with a toothpick with the original application, so that probably helped. I look forward to using this product on future models to cover reweigh data and more. A friend told me if you hold the tape down with a finger the heat from the finger will make it form fit. Absolutely exceptional models, extremely realistic. My modeling period is 1947-1957, but lots of cars were built in the early 1900s and had been rebuilt, modified. I gotta say, the effects you create are fabulous! But a new term was introduced in the article. “Smudge Stick” ?? Do you a photo of the stick to share with us? Great article as usual, Eric, and nice to see such use of the Prismacolor pencils. I’ve been using them for years and feature them in a two-part article I have done for Model Railroad Hobbiest beginning January, 2017. Nice work. Nice effects you achieved with the tape. You may also want to try Frogtape which I believe is the same as Tamyia; however, you would have to cut the widths you used. I wanted to say thanks for turning me on to the Tamiya tape as a tool for weathering. I knew about for years, but only as a tool for custom painting. I ordered my roll yesterday, and will add it to my arsenal for my Ralph vs. Ralph” weathering “battle” at the Garden State RPM next month. Along with a whole bunch of “aircraft/military” weathering supplies and assorted repurposed artists supplies, I want to show my fellow MRR’s that weathering isn’t just powdered chalks and Floquil anymore! Oh, I love the Prismacolor pencils, I’ve been using them before they became “popular”, so to speak, getting those board and rivet line effects are a cinch, and now with the tape, they should be even better!…I did just get my tortillions in the mail today, gotta love that Amazon prime! Previous Previous post: Why model 1926?